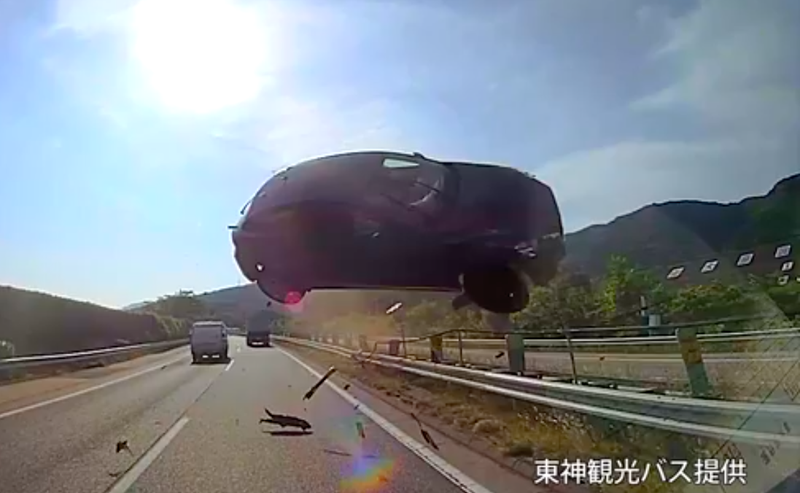 A doctor driving what looks like a Mazda hatchback in Japan somehow launched his car over a divider and directly into a tour bus, killing himself and injuring 45, Japan Times reports. The video of the crash looks like something out of an action film. It is terrifying. According to Japan Times, Ikuma was pronounced dead at the scene, while 45 of the 47 people on the bus suffered injuries. Police say that among those 45, six had broken bones, and the remainder had minor injuries. At a nearby restaurant, 20 to 30 injured passengers were waiting for medical help. While many were able to walk there unassisted, some were bleeding from head wounds after being struck by broken glass, a restaurant employee said. At the restaurant, broken glass was scattered across the floor and those injured were applying ice to their faces and arms, the employee said. The expressway closed for five hours after the terrible crash.